Alternating air mattresses provide excellent pressure relief, but their constant slight movement may be unsuitable for palliative patients who may be in a high degree of pain. 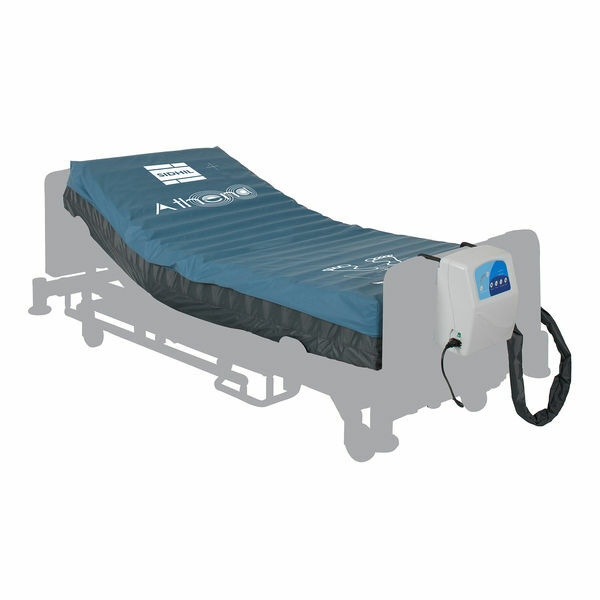 The Sidhil Athena Dynamic Low Airloss Pressure Relief Mattress uses immersion therapy to provide optimum pressure distribution, and is ideal for palliative care and pain management environments. Using vented air cells that circulate around the mattress to improve the patient's microclimate, this mattress is suitable for those with up to grade 4 ulcers, or those at very high risk of developing them. To remove the movement that is often associated with alternating air mattresses, the Athena Mattress uses an immersion therapy system to provide optimum pressure distribution. This makes it ideal for use in pain management and palliative care environments, providing top-of-the-range pressure relief without disturbing the patient. An excess of heat and moisture can greatly increase pressure sore risk, meaning that climate control is an imperative aspect of the process. This mattress improves the patient's microclimate with vented air cells, which circulate air around the mattress, thereby helping to cool the patient and maintain a constant safe environment. This mattress provides a range of features to bolster safety, including an in-built foam underlay to provide support during a power failure, as well as fault alarms and displays to alert carers of any issues. A rapid deflate CPR capability is also included, allowing immediate response in the event of an emergency. 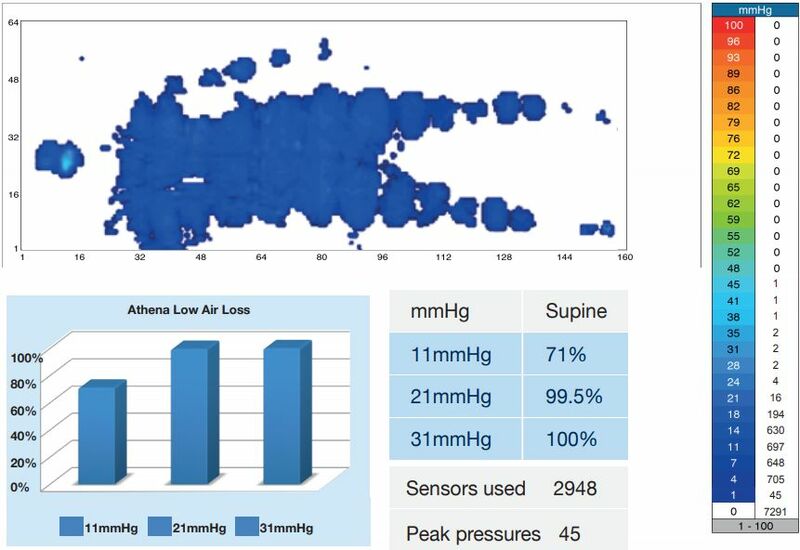 The graphic below displays the pressure distribution of the Athena Low Airloss Mattress when in use. This data was collected using a 66kg model lying in a supine position, with the mattress laid flat on a profiling bed. The test was conducted over a 20 minute period, during which the peak, average and minimum pressures were recorded. Please be advised that the Sidhil Athena Dynamic Low Airloss Pressure Relief Mattress is usually delivered between 1 - 2 weeks of your order being placed. We would advise you to consider this delivery estimation before placing your order and apologise for any inconvenience that this may cause. For more information, please contact our Customer Care Team at 020 7501 0592.